DUBÉ, JOSEPH-EDMOND (baptized Marc-Edmond), physician, professor, author, co-owner and co-director of a medical journal; b. 10 March 1868 in the parish of Notre-Dame in Montreal, son of Pierre Dubé, a carpenter, and Henriette Lévèque; m. there 1 May 1894 Marie-Louise Quintal, and they had four children; d. 25 Nov. 1939 in Montreal. 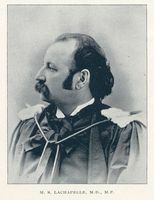 After pursuing classical studies at the Collège Joliette, Joseph-Edmond Dubé enrolled in the faculty of medicine at the Université Laval in Montreal in 1890, graduating with high honours in 1894. He took two further years of training at the Université de Paris where he was awarded his md in July 1896. On his return to Montreal, Dubé was appointed in 1897 to the medical staff of the Hôtel-Dieu as head of the microbiology department. There he assisted Dr Amédée Marien in establishing aseptic procedures. In 1898–99 he helped Isaïe Cormier, a physician at Notre-Dame Hospital, to set up the first medical service at the Crèche de la Miséricorde. In 1898 he attained a professorship in the faculty of medicine at the Université Laval in Montreal. In 1908 he had to curtail his professional activities as a result of bilateral detachment of the retina, which kept him at home for about two years. From 1913 to 1921 he held the chair of tubercular medicine; he was the first incumbent. He became a member of the faculty committee in 1921, which he remained until his official retirement with the title of professor emeritus on 29 July 1938. Very early in his career, Dubé had collaborated in ventures of social medicine. This commitment took several forms: combating infant mortality as well as tuberculosis and alcoholism, and promoting good hygiene. The issue of infant mortality was the first to which he turned his attention. At a conference of the Société Médicale de Montréal in December 1900, he reminded his colleagues of the achievements of Professor Pierre Budin in Paris and George Washington Goler, health officer in Rochester, N.Y., and recommended following their example by setting up a clinic for infants that would provide clean milk in one of the densely populated areas of the city. He believed that through the joint efforts of kind-hearted women and physicians it would be possible to provide this service, which had met with success elsewhere. Despite the prejudices of some colleagues, he was convinced that mothers could learn to care properly for their children and take them to a doctor when there was a problem. He also used the occasion to denounce the lack of support for charitable causes from the Quebec provincial government and the Montreal city council. The project became a reality the following summer with the opening of a consulting clinic for francophones that was part of the movement known as Gouttes de Lait. After eight months of operation, the clinic had to close because of insufficient funding. It would be taken over by Dr Séverin Lachapelle* in 1910. Dubé was involved in the early stages of the Hôpital Sainte-Justine (1907) [see Irma Le Vasseur*], serving as the first president of its medical board in 1908–9. At the beginning of the 20th century, Dubé also waged a tireless battle against tuberculosis. In a lecture given to the Société Médicale de Montréal in May 1901, he took a firm stand alongside those who held that this bacillary illness was an infectious rather than a hereditary disease. In his view, this fact should be communicated to the general public in every way possible, particularly through the schools. He recommended the creation of dispensaries and sanitariums for tuberculosis victims among the poor, as well as a campaign against alcoholism and squalid housing conditions. He collaborated in the formation (1902) and activities of the Montreal League for the Prevention of Tuberculosis, which sought to popularize the means of protecting the public against infection, and tubercular patients from themselves. In 1904 the league opened its first dispensary, which would become the Royal Edward Institute five years later [see Jeffrey Hale Burland*], and it held a large public exhibition in Montreal in 1908. The following year Dubé was a member of the royal commission on tuberculosis, which was chaired by Emmanuel-Persillier Lachapelle*. In the report the latter presented in 1910, he recommended, among other things, that popular-education campaigns be launched and dispensaries set up, endeavours to which Dubé would devote the rest of his career. In one of the more than 100 articles he published in L’Union médicale du Canada, he would state in 1919: “Tuberculosis being a social illness, it had to be fought with a medico-social organization, and, just as in any battle, it is necessary to begin by halting the enemy’s progress, [so] we had to think first about prevention.” As far as he was concerned, the best, and most needed, means of prevention was public education. Whenever the opportunity arose, Dubé did not fail to urge the ruling classes to shake off their apathy towards the struggle against tuberculosis. In 1911 Dubé was actively involved in founding the Institut Bruchési, the first antituberculosis dispensary for francophones, serving on the governing council – he would be its director from 1936 to 1939 – and as president of the medical board. He helped create the dispensary’s fresh-air camps for children who had come into contact with relatives suffering from the disease. With his social connections, his strong philanthropic convictions, and his unflagging enthusiasm, he managed to raise the funds required for the charitable works that he undertook to support. According to Dubé, the fight against tuberculosis would never succeed without a simultaneous attack on the related problem of alcoholism, the other scourge that, as he stated in an article published in L’Union médicale du Canada on 1 Dec. 1910, “is the principal cause of tuberculosis.” In 1909 and 1910, at the invitation of the temperance committee of the Fédération Nationale Saint-Jean-Baptiste [see Marie Lacoste*], he gave more than 100 public lectures across the province to explain the harmful effects of alcohol on health. Dubé believed that promotion of hygiene as a means of preventing infectious diseases was to be done through families and schools. Thus, in a paper he gave in 1906 to the convention of the Association des Médecins de Langue Française de l’Amérique du Nord, he spelled out the rules of hygiene recommended for children of seven or older. In an address to the meeting of the Canadian Association for the Prevention of Consumption and Other Forms of Tuberculosis held in Quebec City in September 1916, he declared that, to make up for years of neglect of preventive measures to combat tuberculosis and other infectious diseases, it was necessary to teach hygiene in the primary schools, colleges and convents, seminaries and normal schools, and technical schools and universities. From early in his career, Dubé took a keen interest in the medical press, the ongoing training of doctors, and their professional organization. In 1900 he became one of the seven co-owners and co-directors of L’Union médicale du Canada; he would serve in these capacities until the end of his career. During the same year he was actively involved in reviving the Société Médicale de Montréal, of which he was president in 1902. That year he also helped found the Association des Médecins de Langue Française de l’Amérique du Nord [see Michel-Delphis Brochu]; he was its president from 1920 to 1922, and chair of the organizing committee for the 1922 convention. In 1934 and 1935 he held the presidency of the Société de Gastro-entérologie. Dubé also believed strongly in promoting the nursing profession. Thus, in 1925, while representing the committee of the faculty of medicine on the board of governors, he collaborated in establishing the École d’Hygiène Sociale Appliquée at the Université de Montréal, whose purpose was to train nurse-hygienists. Later he was one of the most active members on the Commission des Gardes-Malades in the university’s faculty of medicine. After the 1921 enactment of the law establishing the Quebec Bureau of Public Charities, which included a provision to share the costs of hospital care for the poor, hospital physicians, who usually provided free treatment for the underprivileged in wards and dispensaries, began to challenge this state of affairs. To back up their demands, they founded the Association des Médecins des Hôpitaux de Montréal in 1935, which, with Albert Le Sage as president and Dubé as vice-president, began a long campaign to obtain the right for its members to be paid for their work. Moreover, noting that the francophone hospital network was insufficiently developed compared to the one serving the anglophone minority, Dubé insisted that the public authorities intervene to support the private health-care initiatives of the religious and lay communities. Dubé took every opportunity to stand up for the sick or the injured who were victims of abuse or neglect. Therefore, as early as 1906, in an article published in L’Union médicale du Canada, he had pointed out that Montreal had become a major industrial centre employing thousands of people, which inevitably led to an increase in workplace accidents. He asked whether workers were operating in safe environments, and whether employers would look after them if a problem occurred and would offer them fair compensation. His answer was in the negative. Dubé described how, whenever workers sued for damages in the courts, the advantage lay with the employers because they could afford the best lawyers and medical experts. In the same article he declared that workers’ associations could form “defence committees” that would give workers more power in court. Throughout his professional career, Joseph-Edmond Dubé distinguished himself by his social commitment. He was at once a well-respected clinician and professor, an apostle for preventive and social medicine, a promoter of ongoing medical training, a defender of the right of hospital physicians to receive fair pay, and an ardent supporter of the development of the hospital network. In the days following his death, several leading public figures paid tribute to him, underscoring his remarkable contribution. Social medicine, defined in the tradition instituted by the German physician and politician Rudolf Virchow as the search for the social causes of illness and intervention in the socio-economic field, found in Dubé one of its most illustrious exponents in the province of Quebec. Between 1896 and 1939 Joseph‑Edmond Dubé wrote numerous articles, several of which were consulted in the preparation of this biography. In L’Union médicale du Canada (Montréal), he published: “La mortalité infantile et les moyens de la diminuer,” 30 (1901): 12–26; “Les accidents de travail: l’ouvrier et les grandes compagnies,” 35 (1906): 77–81; “Alcoolisme et tuberculose,” 39 (1910): 720–26; “Montréal la plus importante ville du dominion se doit d’être au premier rang dans la lutte antituberculeuse,” 48 (1919): 572–82; “Nos hôpitaux: le passé, leur évolution, le présent,” 61 (1932): 148–234; “Les débuts de la lutte contre la mortalité infantile à Montréal: fondation de la première ‘Goutte de lait,’” 65 (1936): 879–91, 986–93, 1088–1102; and “La lutte pour notre survivance économique,” 68 (1939): 1322–25. In L’Action médicale (Montréal), he published “La situation hospitalière à Montréal,” 4 (1928), no.9: 208–14; no.11: 263–64; no.12: 269–75. In collaboration with Albert Le Sage, he wrote “Les hôpitaux et les médecins: rapport au conseil des ministres de la province de Québec,” L’Union médicale du Canada, 64 (1935): 1183–1200. BANQ-CAM, CE601-S51, 12 mars 1868, 1er mai 1894. Le Devoir, 27 nov. 1939. La Presse, 1er déc. 1939. E.‑P. Benoît, “Joseph‑Edmond Dubé,” L’Union médicale du Canada, 68 (1939): 1285–86. Marcel Cadotte, “Historique du laboratoire de pathologie de l’Hôtel-Dieu de Montréal: de sa création en 1896 à l’arrivée du professeur Pierre Masson en 1928,” L’Union médicale du Canada, 108 (1979): 479–94. Rita Desjardins, “Hôpital Sainte-Justine, Montréal, Québec (1907–1921)” (mémoire de ma, univ. de Montréal, 1989); “L’institutionnalisation de la pédiatrie en milieu franco-montréalais, 1880–1980: les enjeux politiques, sociaux et biologiques” (thèse de phd, univ. de Montréal, 1998). Sara Gosselin, Camp David-Perron de l’Institut Bruchési de Montréal inc.: notes historiques ([Montréal?, 1931?]). Denis Goulet, “Des miasmes aux germes: l’impact de la bactériologie sur la pratique médicale au Québec (1870–1930)” (thèse de phd, univ. de Montréal, 1992). Denis Goulet et André Paradis, Trois siècles d’histoire médicale au Québec: chronologie des institutions et des pratiques (1639–1939) (Montréal, 1992). Guy Grenier, 100 ans de médecine francophone: histoire de l’Association des médecins de langue française au Canada (Sainte-Foy [Québec], 2002). Yves Lajoie, “Histoire de l’Institut Bruchési et son engagement dans la lutte contre la tuberculose à Montréal (1911–1945)” (mémoire de ma, univ. de Montréal, 2002). Albert Le Sage, “In memoriam: Dubé,” L’Union médicale du Canada, 68 (1939): 1277–84; “Une chaire de phtisiothérapie à Laval, de Montréal,” L’Union médicale du Canada, 42 (1913): 311–15. Georges Desrosiers, “DUBÉ, JOSEPH-EDMOND (baptized Marc-Edmond),” in Dictionary of Canadian Biography, vol. 16, University of Toronto/Université Laval, 2003–, accessed April 23, 2019, http://www.biographi.ca/en/bio/dube_joseph_edmond_16E.html.